Cooking a whole bird is probably my least favorite task in the kitchen. Something about it just makes me want to moan and groan and … well, just find someone else to do it! Until I found this method. It’s SO EASY. I first saw this on Slow Cooker From Scratch, and have since been seeing it all over pinterest. So, of course, I had to try it out. 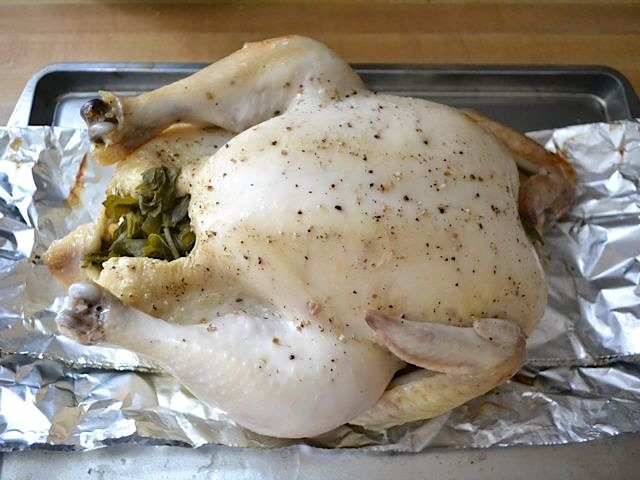 It’s easy, you can season it any old way you like, and it’s a great alternative to the store bought rotisserie chickens. The meat is ultra tender when done and with just a few minutes under the broiler, the skin is just as golden and crispy. You can serve this whole as a main dish or pick the meat off to use on sandwiches (say good bye to salty deli meat! ), burritos, tacos, enchiladas, salads, or a million other things. I have a fairly large slow cooker and to this day I still don’t know it’s official size – it’s somewhere between 5 and 7 quarts. I chose a 5 pound chicken, which by the look of it, would fit nicely in my cooker. It just barely fit. 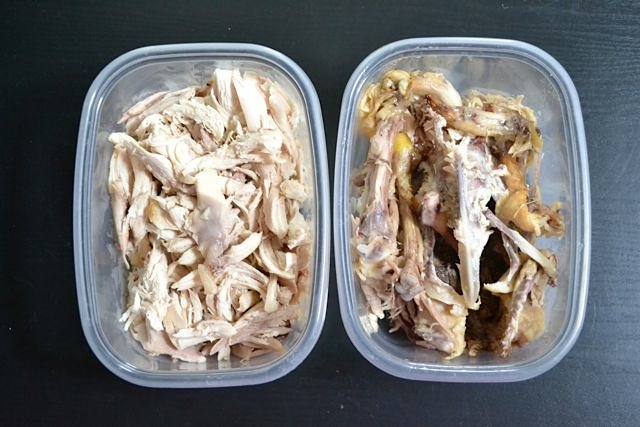 So, my suggestion is to find a chicken that looks like it will fit, and then pick one that is smaller than that one ;) My chicken yielded about 6 cups of cooked meat. 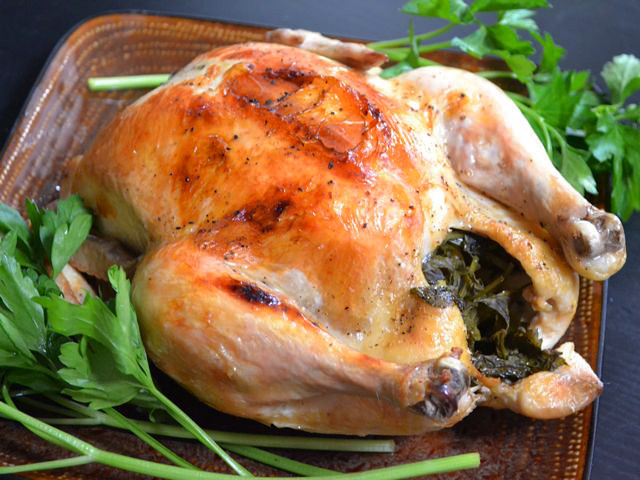 Avoid having to heat up the whole oven by making this slow cooker roasted chicken. 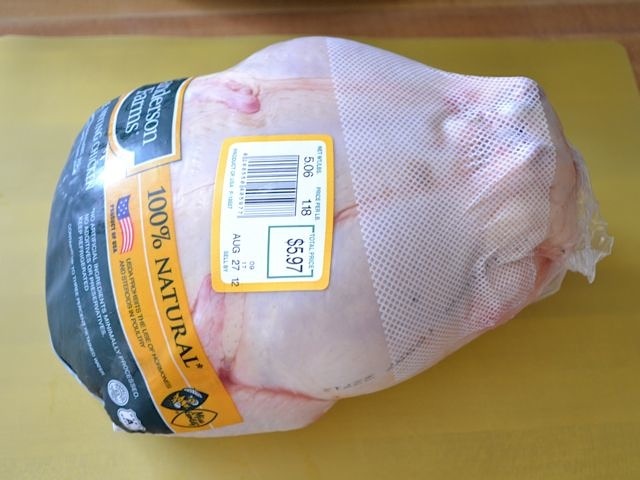 Remove the chicken from its packaging over the sink and allow the juices to run out. Remove the giblets from the cavity and discard them. 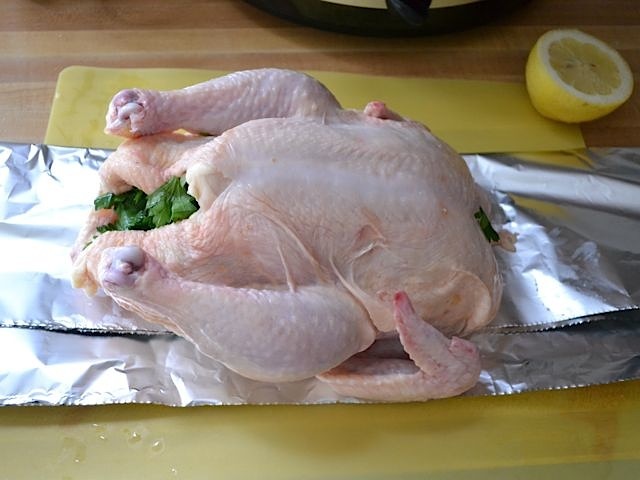 Fold a long piece of foil lengthwise to form a sturdy sling and place the chicken on it (see photos below). Cut the lemon in half and then cut one of the halves into quarters. Stuff the quarters inside the cavity of the chicken. Peel the garlic cloves and stuff them into the cavity along with the whole sprigs of parsley. 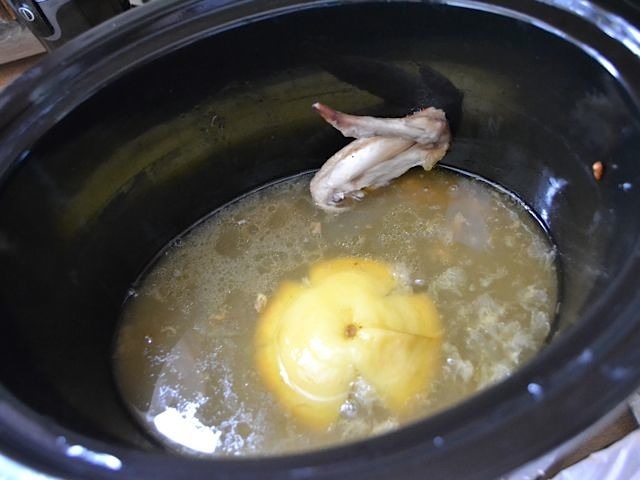 Take the second half of the lemon and place it face down in the center of the slow cooker. This will help the chicken sit up off of the bottom of the cooker. Using the foil sling, lift the chicken into the slow cooking, placing it on top of the lemon. Fold the sides of the sling into the cooker, secure the lid, and cook on high for four hours. 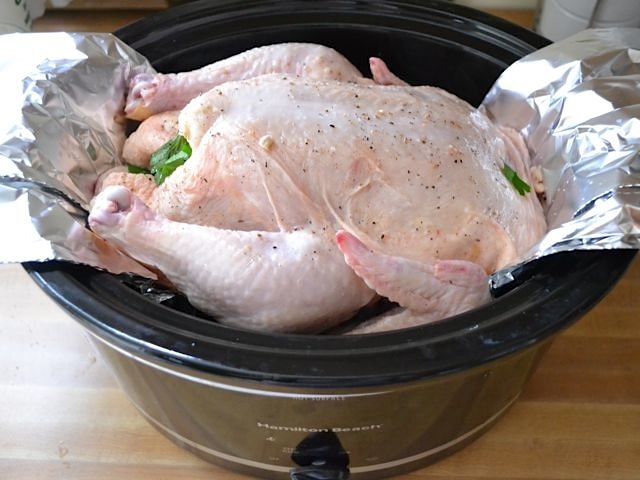 After cooking on high for four hours, carefully lift the chicken out of the slow cooker using the foil sling and place on a baking sheet. Set the broiler to its low setting and cook the chicken under the broiler (5-6 inches from the flame) until the skin is golden brown and crispy (5-10 minutes). Let the chicken rest for 10 minutes before cutting or serving. Some recipes suggest cooking on low for 8 hours, but I don’t condone this. 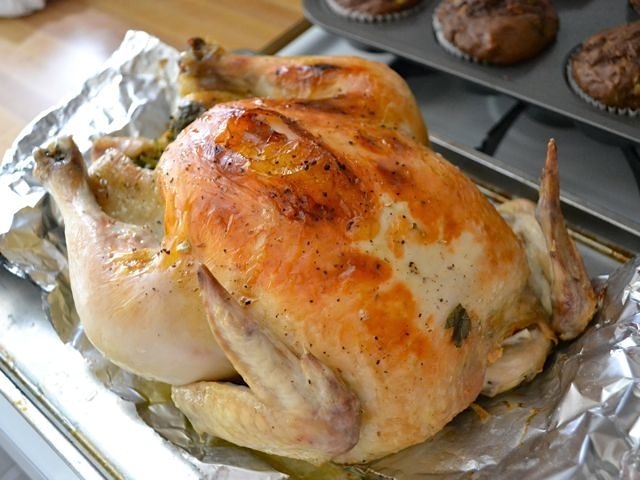 Even on high the chicken takes quite a while to heat through and get out of the “danger temperature zone.” If you want to cook it longer, at least set it to high for the first two hours to prevent the chicken from being at optimal bacteria temperatures for too long. This was the chicken that I bought for $1.18 per pound. There was another brand that was $0.99 per pound, but I felt better about this one. Call it a gut feeling. Plus, I figured I could afford the extra dollar. Sometimes you have to compromise. Remove the packaging from the chicken. Do this over the sink because there will be quite a bit of juice/water that comes out. Remove the giblets and whatever else (eww) may be stuffed inside. (This is why I usually want someone else to do it!). I stuffed my chicken with lemons, garlic, and parsley because I like those things, but you could do anything like rosemary, thyme, or whatever else you like. So, I stuffed those yummy things into the cavity of the chicken. I used half of the lemon (in the background) to prop the chicken up off of the bottom of the pot. Placing the chicken on a foil sling not only helps keep it up off of the bottom, but it also makes it SUPER easy to lift the chicken out afterwards. The chicken will be really tender, so if it weren’t for the sling it would have fallen apart while trying to take it out. 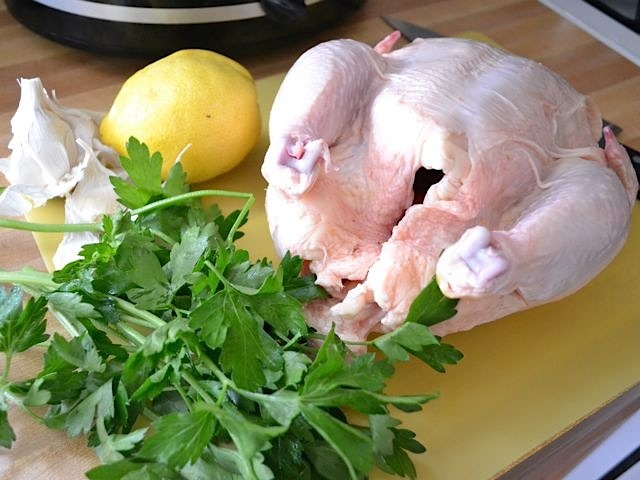 The second half of the lemon is sitting under the chicken. I also sprinkled salt and pepper on the chicken, but later realized that was completely unnecessary since I just removed the skin anyway. I tucked the ends of the foil sling in so that the lid could make a good seal around the edge and hold the heat in. Turn the slow cooker on to high and let it go for four hours. And now the chicken is cooked through and tender! As you may notice, the skin is very blond. You only get that nice golden, crispy skin with dry heat, so we have to pop it under the broiler for a few minutes. It really is a quick and easy step. 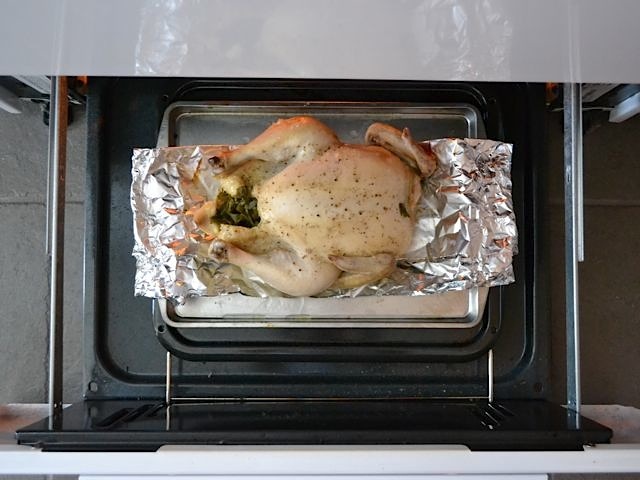 Use the foil sling to lift the chicken out of the slow cooker and onto a baking sheet. One of the wings was touching the slow cooker and it stuck… the meat was so tender that it came right off as I lifted it out! Ooops. My broiler is actually in a drawer under the oven, while most electric ovens have a broiling coil on the roof of the main oven compartment. 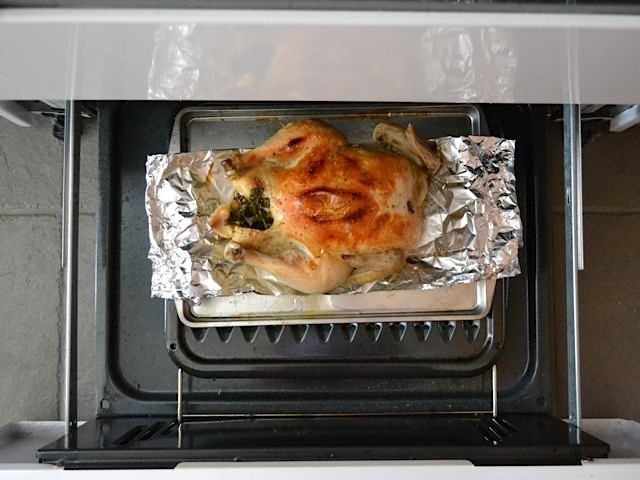 Turn the broiler on to low and make sure that your oven rack is set so that the top of the chicken will be about 5-6 inches from the heat source. Let it broil until the skin is golden brown and crispy. This will likely be a different amount of time for every oven and every chicken, so just keep an eye on it. You’ll hear the skin popping and crackling. I let mine broil for exactly five minutes, although it probably could have gone a few minutes more. Even still, it was pretty! Let the chicken rest for about 10 minutes before cutting so that the steam pressure can reduce and the juices stay in the meat. If you’re going to pick the meat, let it cool to a temperature where it is easily handled. I find that a warm chicken is easier to pick than one that has been refrigerated. Ummm, pay no mind to those chocolate muffins in the background… those are for the cookbook! I got about 6 cups of chicken meat off of my 5 lb. chicken. I also saved the carcass because I made chicken stock with it! You’ll see that post later this week!! I don’t use aluminum anything in my cooking including aluminum foil. I was quite successful in using my turkey lifter (a wire device that goes under and around the bird) instead of the sling you mention in the recipe. Just so folks know that there is an alternative to using aluminum. If you check you will see various warnings on the web re the use of aluminum. I am a survivor of non-Hodgkins Lymphoma. I don’t mess around with food safety. The recipe turned out very well. Several times I have had had such success with this recipe. So much so that this week I am trying it with a small 8lb turkey. Since the recipe is written for a 4-5 lb bird, I will double the lemon, parsley, garlic. I expect it will go well. I could change the herbs to sage, thyme, rosemary, but that would increase both the cost and if-factor. Playing it good and safe. I wil, try this with a very small young turkey, about 10lbs. Even with a 7 lb chicken, there is space for more chicken. I know I will have to stuff the turkey in there, but I will try. I think it will work. I would rather let the slow cooker cooknthe turkey then to follow all the complicated directions of turkey roasting. I cooked this for me parents and my son. The chicken was so tender. I served it with some garloc butter pasta and a green salad. Standard menu. Outstanding chicken. The next day, I mashed the chicken in my hands and placed/spread it on my bread to make a sandwhich. I added sliced Roma tomatoes and basil from my garden. I cannot say how much I enjoyed that sandwhich. The best, more tender, juiciest chicken sandwich I have ever had. This will be a go-to recipe. My family and I lover it. I am trying this recipe this week. I am so excited. Glad to learn about a foil sling. Never knew. You should save the giblets for your chicken broth. My favorite herb to use with chicken is Tarragon. It just blends so well with the meat and gives it a divine aroma and flavor. Some people don’t like it though because it does taste a bit like licorice. I absolutely hate licorice but love tarragon! I find the licorice flavor to be very mild compared to anise or fennel. Chicken salad with tarragon is a favorite. 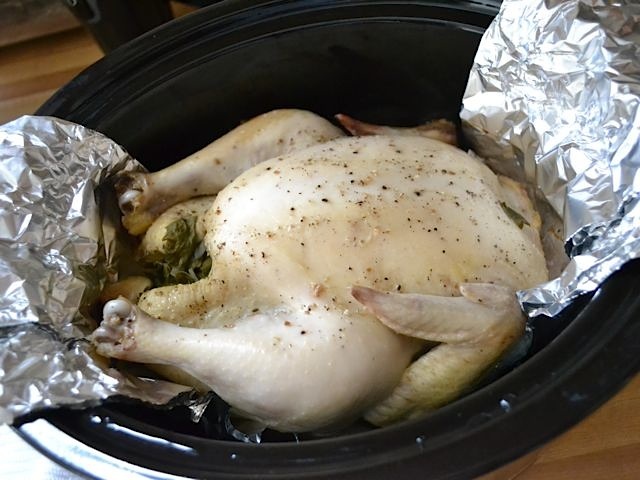 This is a great way to do a whole chicken in the crockpot. I’ve never used a sling before, but I will from now on. Another handy tip for this method of cooking is to place four baseball-sized foil balls on the bottom of your crockpot to set your chicken on. It’s another terrific way to keep your meat off the bottom and to prevent it from stewing in the fat and juices. I made this recipe the other day and didn’t have a lemon. Instead I used an onion as my platform to keep the chicken off the bottom of the pot. It worked well and was delicious. I haven’t thought about broiling it after to get the browned skin, will definitely try that next time. I like to layer quarters of onion and chunks of bell pepper on the bottom to hold mine up. It gives a really good flavor and I leave them for making chicken stock with the carcass. All the people that say they used an onion, green pepper or other vegetable to hold the chicken up off the bottom, did you use the aluminum sling also? And if you did not, how did you handle getting the bird out of the pot? 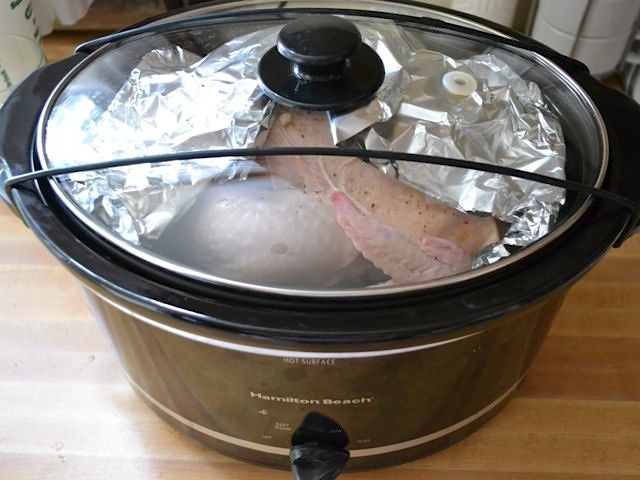 Anon – Having liquid in the slow cooker definitely helps heat transfer, which is why it is usually suggested. But, for some recipes you can get away without. Because we’re dealing with raw chicken here, you definitely want to make sure to cook it on high for the first four hours so that the temperature rises as quickly as possible. hi i wanted to try this, but i thought you had to add some sort of liquid to a slow cooker. to clarify, no water at all is needed with the lemon at the bottom? thanks! !